Discussion in 'Dovetail Live Article Discussion' started by TrainSim-James, Nov 2, 2018. We’re nearing the end as we count through our penultimate 8 reasons that you should be playing Train Simulator, and if you already are, maybe there will be some you haven’t thought of! Train Simulator 2019 released a few weeks ago, and it already features a fantastic array of routes and rolling stock, but this week, we’re going to show you just how easily you can grow your collection from the base package. I guess I have to be the one to say it, but these reasons are kind of being stretched out. Honestly. I think it was done after the first one or two articles. The rest just kinda serve as filler. Yeah. The first couple were ok as it was introducing TS2019 and 64-bit. These recent ones, especially this one, feels like its just done to try and sell lots of DLC. 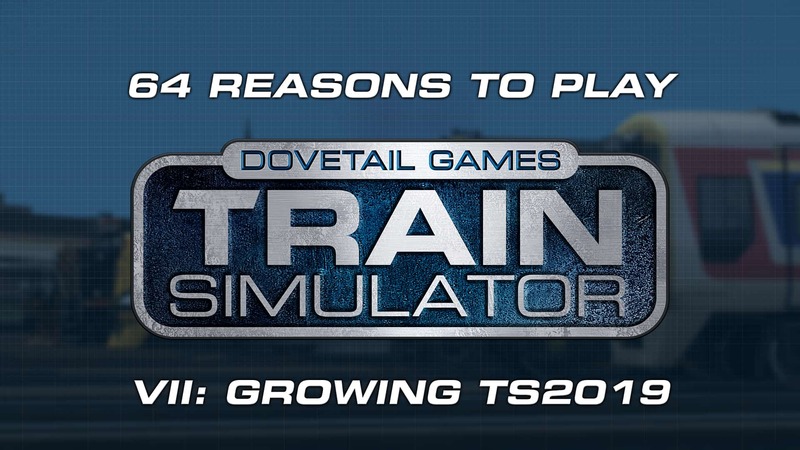 I think for this "Growing TS2019" one it would of been nice to show off, not just what Dovetail have done, but what the community has done. Could of named the subheadings/numbered paragraphs things like; Routes, Trains, Reskins, Modifications etc. Thats how to grow TS20XX, downloading and trying out what the community has made, not just DLC on Steam.